Pediatric Dentist in Bergenfield Talks About Loose Teeth! There are many things that signal your child growing up. Their first haircut is just the beginning, following the start of their school career, and somewhere soon thereafter they might have their first loose, wiggly tooth. Back in the day, you might have been encouraged to pull out your child’s loose tooth in an unconventional way, but your pediatric dentist in Bergenfield highly discourages that! Learn why in this week’s blog post. As your child starts the first grade (around the age of 5 or 6), the roots of their front teeth will start to dissolve, causing them to lose their very first teeth. As this occurs, they will become wiggly, allowing your child to jiggle it back and forth in their mouth with their tongue. When they have dissolved enough, they will completely fall out without any pain, little to no blood, and it will be a positive experience. Then the natural process will continue, allowing their permanent adult teeth to develop. As mentioned above, you may have been expected to pull your own tooth growing up in the past. Whether your tie it to a string and door knob or had the creative help from an older, mischievous sibling, it is best to avoid doing this to your child’s smile. Teeth will naturally fall out on their own when they are ready. If you pull the tooth too soon , it could damage the root of the tooth and lead to other dental problems in the future. What happens if your child’s tooth won’t come out on its own? 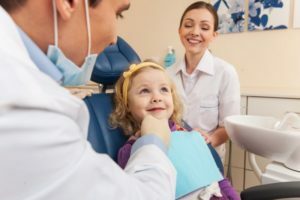 If it has been several months and your child’s loose tooth won’t fall out by itself, it is time to call your children’s dentist in Bergenfield. Your pediatric dentist will evaluate the affected tooth, taking diagnostic images to view the tooth root. Your dentist may recommend leaving it in place if nothing seems to interfere with their oral health. However, there is a problem, then your dentist may recommend having your child’s tooth extracted. In most cases, you have nothing to fear when your child starts to lose their baby teeth. The majority will fall out on their own and their permanent smile will take it’s place. The first time that your child loses their tooth, be sure to visit your dentist to make sure their smile is developing correctly. Here at Smile More Kidz, our whole office loves helping little one’s smiles develop throughout their early years. It’s important to have a healthy smile foundation starting with baby teeth, and we do our part to keep your little one’s teeth and gums in great shape. If you want to keep your child’s teeth strong and healthy, give us a call today to schedule their next visit. Comments Off on Pediatric Dentist in Bergenfield Talks About Loose Teeth!